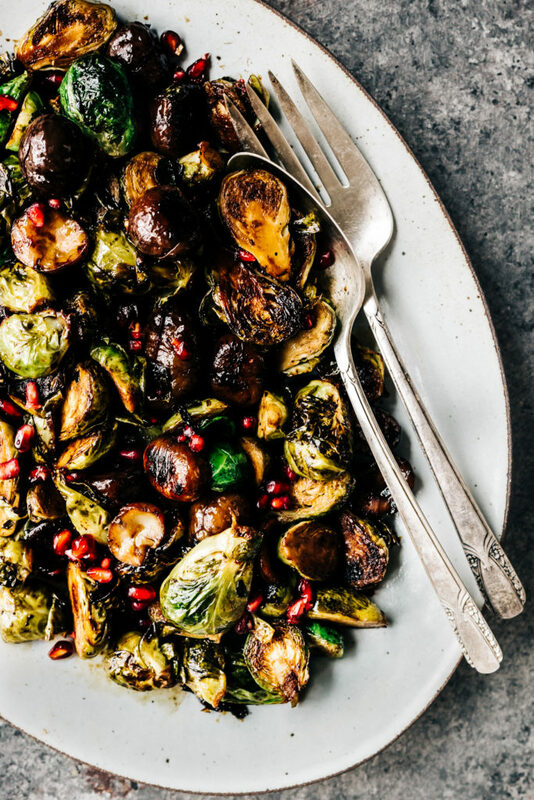 Now this is the way to serve brussels sprouts! They’re sautéed until perfectly crisp and get bulked up with roasted chestnuts and pomegranate seeds before getting tossed in a lovely maple-bourbon sauce. I’m excited to serve this dish over the next few weeks and I hope it finds its way to your holiday table as well. If you aren’t a bourbon fan don’t worry–the flavor is very mild once it’s cooked down and the maple syrup and dash of cayenne tie everything together. Sweet and spicy is my favorite combination and this sauce does not disappoint! Also–you can cheat here and purchase pre-packaged roasted chestnuts if you’re not up for the hassle of roasting/peeling them yourself. However, I’ve found a wonderful method that I’ll link to in the recipe for roasted chestnuts that works beautifully (and they taste better than the store-bought ones!) Regardless of which method you choose I hope you enjoy this festive side dish as much as we do. Heat the olive oil in a large skillet over medium-high heat. Add the brussels sprouts and cook, stirring occasionally until they begin to brown up and become tender, about 15 minutes. Stir in the chestnuts and continue to cook, stirring occasionally, for another 10 minutes or so. While the brussels cook prepare the glaze. In a small saucepan bring the bourbon to a boil over high heat. Reduce the heat to low and simmer until it's reduced by half, about 3 minutes. Stir in the the maple syrup, apple cider vinegar, cayenne and salt. Simmer for about 1 minute longer. Remove from the heat and whisk in the olive oil. Drizzle the sauce into the pan with the brussels and chestnuts and cook over low heat until the the veggies are coated in the sauce and the mixture thickens. Stir in the pomegranate seeds and remove from the heat. Season to taste with salt and pepper and serve warm or at room temperature. Wow, I want to eat a whole platter of this! I know brussels sprouts aren’t everyone’s thing but I happen to be crazy for them, ah, and chestnuts too, YUM! something different in way it is sent ?????? Thank you for this recipe!! You are my go-to for creative, tasty holiday meals!! !